Turnbuckles are commonly used to adjust the tension between two cables or ropes by rotating the frame, which causes both eye bolts to be screwed in or out simultaneously. 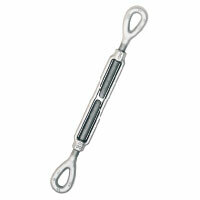 Turnbuckle assembly combinations include: Eye and Eye, Hook and Hook, Hook and Eye, Jaw and Jaw, Jaw and Eye. Can be used in numerous industries including: aircraft, construction, shipping and entertainment. Crosby's Quenched and Tempered end fittings and normalized bodies have enhanced impact properties for greater toughness at all temperatures. Hooks are forged with a greater cross sectional area that results in a stronger hook with better fatigue properties. Modified UNJ thread on end fittings for improved fatigue properties. Body has UNC threads. Turnbuckle eyes are forged elongated, by design, to maximize easy attachment in system and minimize stress in the eye. For turnbuckle sizes 1/4" through 2-1/2 ", a shackle one size smaller can be reeved through eye. Forged jaw ends are fitted with bolts and nuts on sizes 1/4" through 5/8", and pins and cotters on sizes 3/4" through 2-3/4". TURNBUCKLES RECOMMENDED FOR STRAIGHT OR IN-LINE PULL ONLY. Lock Nuts available for all sizes. Typical hardness levels, Tensile Strengths and Ductility Properties are available for all sizes. 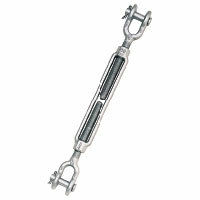 Turnbuckles can be furnished proof tested or magnaflux inspected with certificates if requested at time of order. Crosby products meet or exceed all the requirements of ASME B30.26 including identification, ductility, design factor, proof load and temperature requirements. 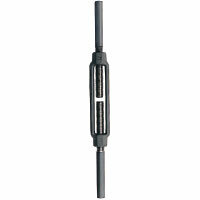 Click on the images below to see more information on turnbuckles in our catalog.